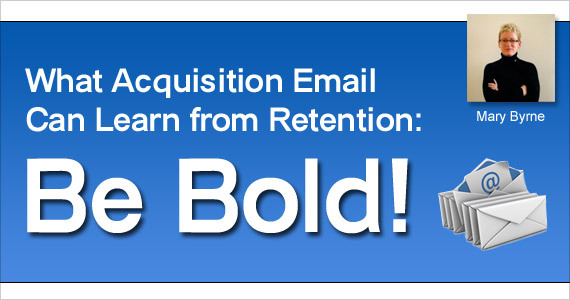 What Acquisition Email Can Learn from Retention: Be Bold! George Bilbrey of Return Path wrote a thought-provoking piece for MediaPost on how marketing objectives interact with deliverability objectives. The article takes on the question of whether deliverability tactics are at odds with marketing best practices. The response, to paraphrase, was that improved deliverability increases revenue, reduces the chances of damage to sender reputation, and improves engagement rates. In essence, Bilbrey says that to build lasting success in email, marketers should be bold and follow the hard data, rather than worrying about going against their gut or short-term gains. I would challenge email marketers this year to bring that bold mindset to acquisition email and to focus on doing things right. Be Bold . . . The digital marketing industry is undergoing a sea change in its attitude toward acquisition email. As new technologies on the market make complex targeting feasible, the bold among the industry are blazing the trail from retention email to the acquisition email market. ROI – Email has a high ROI, and bringing that ROI to a customer acquisition channel can bring down overall acquisition costs. Data – Email is highly trackable. After a successful campaign you can use your reporting data to scale out that success (both to other email campaigns and to other channels entirely). Skill Transfer – This is the most important thing you can take away from this post. 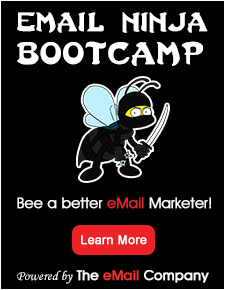 It is possible to bring the knowledge and skills you have amassed in retention email to acquisition email campaigns. Upholding the same rigorous standards for permission, targeting, and content will reward marketers in acquisition email as well. Just as with any industry change, the first to adapt will see the greatest benefits, both in terms of ROI and in terms of knowledge gained. So be bold in 2012 and test out this new customer acquisition channel. While email marketers can transfer much of their knowledge from retention campaigns to acquisition campaigns, there are critical differences in how you should approach this new market. One of the most important elements to get right is respecting subscribers. Absolute musts – We say this a lot, but permission is especially key in acquisition email. This means working with third-party opt-in records only. You should also make it easy to opt-out of future mailings by making unsubscribe links visible and simple to use. Honesty is another non-negotiable element. It should be clear to subscribers who you are, who owns the list you are mailing to, and what you are offering. You can (and should) make this clear before subscribers even open the email by using straightforward sender information and a clear, concise, and truthful subject line. Raise the bar – IBM recently predicted that in the next five years, spam will become a thing of the past because email will be so targeted and relevant. Work to achieve that kind of relevancy by segmenting your mailing through demographic targeting (using information from the publisher) or behavioral targeting (using an email ad exchange platform, like ividence). What are your goals for your email program this year? And what bold action will you take to achieve them? Profile: Mary Byrne, SVP Americas, leads the ividence sales and marketing team in the U.S. ividence is a stand-alone acquisition email ad exchange that uses behavioral targeting to improve campaign performance for advertisers and maximize revenue for publishers. Mary has nearly 15 years of experience in the technology sector, with special emphasis on advertising technology and email deliverability. Previously, she led the sales, marketing, and client services efforts at DoubleClick, Microsoft and Level 3 Communications. Most savvy marketers are looking well beyond e-mail to target their key demographic. How many people 18-28 ever look at e-mail except at work?